Humans have banished the gods from the face of the Earth. Basically in doing this, they have also released ancient creatures that are older than mankind itself, which reside in ruins that have sprung up all over the island. Piranha Bytes Risen begins with a boat at sea, and you the main character has stowed away on. The boat is attacked by a creature that is invisible to you the main character, but not to the Inquisitor which is also on board. A menacing looking man, with a jewel over his eye that allows him to see the beast. The Inquisitor attempts to battle the creature, but soon realizes his attempt is futile. He disappears from the deck of the boat leaving the crew and you the stow away in the path of the beast. A giant wave crashes into and destroys the boat. You awaken on the beach of an island and realize that you were not alone as a stow away on the boat. A beautiful woman named Sara, who is also stranded on the island, and proceeds to follow you around as you investigate the island. Risenhas not received as much publicity as some of the bigger and more well known RPG’s. Could be because the North American 360 version of the game comes 5 months after the PC and European versions launched. 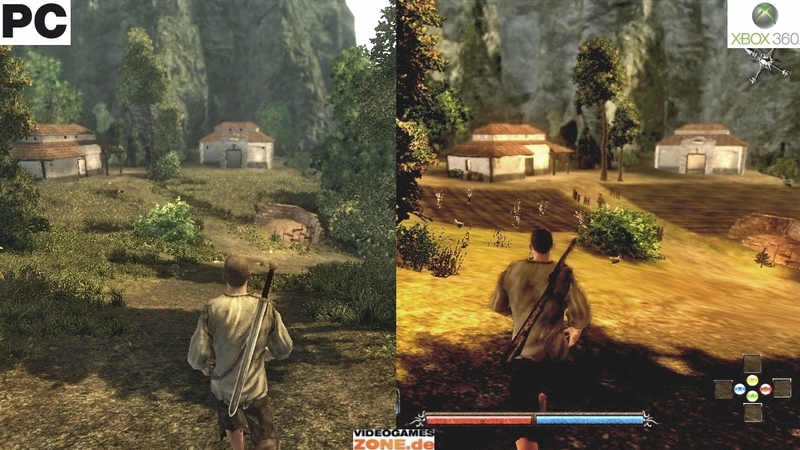 Not helping matters much is that the PC version is considered technically and graphically superior to the 360 version. 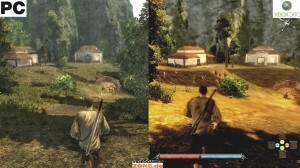 Piranha Bytes’ latest RPG is very similar from a graphical standpoint. 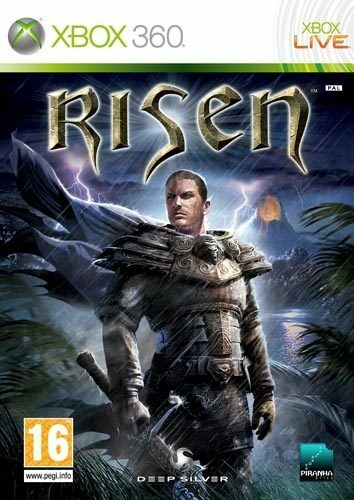 However, Risen is a little easier from a user standpoint compared to games like Piranha Bytes’ Gothic series. As you make your way around the beach, you realize Sara and yourself are the only survivors from the shipwreck. You find items around the beach that will be beneficial to yourself including gold coins, shellfish, and weapons such as swords. There are also birds of prey that are also interested in the remains and you have to battle them right off. Items around the island are not hard to find. You make your way into the interior of the island finding more animals, healing plants, mushrooms, etc. Making your way further into the island is where your adventure begins and choices that you make from here out decide your fate. There are 3 factions that you can join on the island, which you find out is called Faranga. 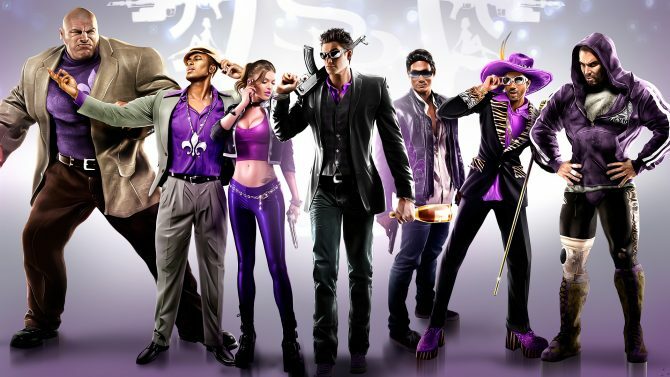 Don Esteban is the first faction you come across. They are the former controllers of the island which have been driven into the swamps of the island. You are offered a chance to join this faction, or seek out one of the other two factions. The Inquisition is the most powerful of the factions. They are soldiers who have come to the island to investigate the ruins. The Inquisition has taken over the island and driven the Don Esteban into hiding. The third faction is a group called the Mages, who are the former protectors of the island, and are now in the command of the Inquisition. They are a group surrounded by magic and secrecy. You as the player must choose which faction to align with, but choose carefully, as your journey will be directed by the decision you make. The basic premise of the game, like many other RPGs, is to better yourself. You gain experience points by upgrading your weapons and other items that you gather throughout the game. Fighting and defeating enemies also gains points for your character, but a losing a battle will take points away. Trading is also a huge part of the game. A trader may have something you want. You can either buy the items or you can complete a task and they will be given to you after completing it. You can groom your character into the greatest of warriors or the trickiest of magicians. Armor, helmets, and shields will give you an added edge when battling the forces of evil. As the gamer, it is up to you what tasks you take on and the level you become. Upgrades are unlocked as you complete each task put before you. side tasks are aplenty in the early stages of the game. You learn which weapons you are most comfortable with such as swords, bows, etc. The island that Piranha Bytes has created is vast considering that it is much smaller than most RPG landscapes. 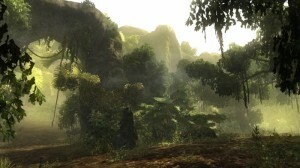 There are many different areas to explore such as Harbor Town, the swamps, the forest, and the mountain regions. But with the many different areas comes graphics that really didn’t do much for the imagination. However, the game is not hindered much with the obvious lapse in detail. Obviously, the PC version is the winner in this category as well. Those of you with HDTV’s don’t adjust your screens. It really looks that way. It does however draw you into wanting to keep going just so you can see what is next. Once you move past the first phase of the game and you have the necessary needs, then this venture becomes a whole lot easier. 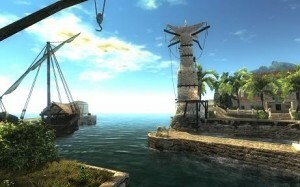 If your a veteran RPG player, then you are going to want to jump right in to exploring the island. This is where many gamers are going to get frustrated. Unless you complete certain tasks in the game, then not every part of the island is going to be open to you. Again, decision drives where and when you can visit certain locales in the game. The beginning of the game points you in the right direction. Once you’ve completed that portion, then everything opens up to you. This is when the island of Faranga really shows itself to the gamer. Patience is key with Risen, and will be rewarded with the time put into it. 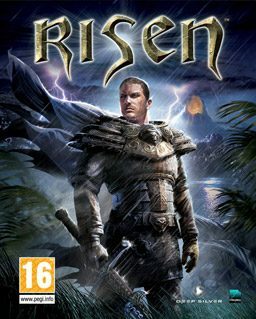 One of the other problems with Risen is the player control. The ability to move in a 360 degree motion is hard to say the least. At some points during a battle, your opponent can move with ease, as your swinging your sword at thin air. There is a sidestep motion that can be used, but it does little to help especially if there are more than one combatant. Frustration can lead to much cursing at the screen. Patience is hard to come by in this department, but you can get used to this with time. Just don’t go straight into it thinking your gonna have complete response from your character. You can however unlock news fighting moves from obtaining weapons. This does in the end make the game a little more enjoyable. 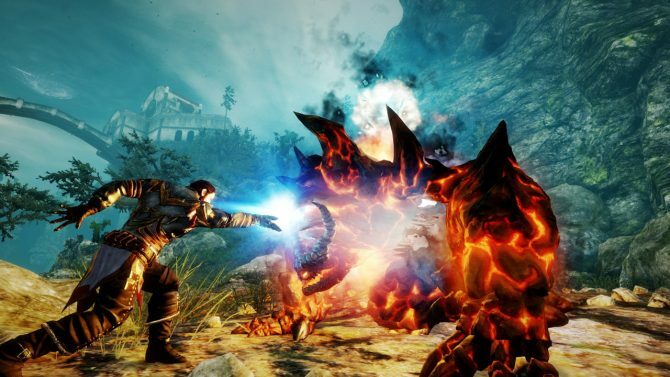 Risen for the 360 is not your perfect RPG by any means. It has issues with frame rate, player control, and sometimes very confusing tasks. That being said, if your a gamer who has played role-playing games, these are all issues that are common with an open game type. Sometimes you have to sacrifice certain aspects to make room for others. Lovers of this genre will be a lot more understanding of the short comings of Risen and will be more apt to give it a second chance.